MS® Quantitative filter paper is mainly used for quantitative chemical analysis of the gravimetric analysis of the pilot trial and relevant analysis experiment. The filter paper can be applied to scientific research, industry, agriculture, health, tertiary institutions, teaching experiments, environmental protection test, etc. MS® Qualitative filter paper can be divided into fast, medium speed and slow three categories when measured by filtering speed and separation performance. 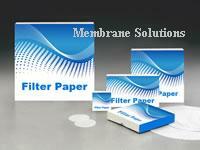 Quantitative filter paper has the round size that is similar to qualitative filter paper. Quantitative filter papers are the choice for gravimetric analysis. High purity hardened filters have a high wet-strength and are chemical resistant to handle vacuum filtration or acid/alkali solutions. Analytical separations, or air and water analysis.